The 10x10 Suncast Storage Shed wins our 4th place pick for top sheds based on design, durability, packaging, and value. Like the other models that we have reviewed, the Suncast 10x10 offers a lot of nice options and features that work with many people’s storage needs. Suncast Corporation has had a strong reputation of producing many great outdoor, indoor and landscaping products for many years. Their goal is to design products that are easy operate and assemble, which is apparent with this 10x12 shed we are reviewing. When the unit first arrived, it came in 4 independent boxes and was fairly easy to unload with the help of another person. Assembly was also a breeze and was slightly different than the other models we’ve tested. Whether this is a good or bad thing, nearly 90% of the shed constructs without the use of any tools. This will come in handy for a light-hearted assembly process, though it raises a few flags as far as durability in the event of a storm. This theory we came to after witnessing many cheaper models that didn’t require assembly fall apart in a snow storm. Luckily, the Suncast 10x10 is built out of sturdy resin walls which seem heavy and durable enough for even the roughest climates when assembled. Out of the box, the walls seemed a little questionable on stability, but once everything was assembled, the structure was tough as a whole. The 10x10 along with other Suncast models come with a fairly decent assembly manual. I would have to admit that they did leave some important information out like talking about the foundation in detail. Almost every shed company recommends building the shed upon a sturdy foundation whether it is a concrete slab or treated lumber. The physical features of the shed are simple but compelling at the same time. The structure uses the same siding you see on other vinyl sheds with a roof that has a chimney-like structure. The height of the shed is about 7’ 6 ½” with the door opening a little bit shorter than the Lifetime Shed at 4 ½’ x 5 ½’. 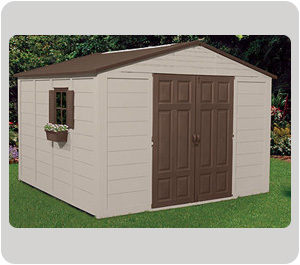 The dimensions of this shed allow plenty of space for all of your storage needs with a total of 625 cubic feet of foot capacity. The floor is very durable as we tried a few tests to get it to flex using certain objects like a riding lawn mower along with some of us jumping up and down to cause an issue. It did great in either instance and it also didn’t scratch or chip away at the resin at all. The structure from the outside is a light-taupe color with bronze accents around the windows and other trim pieces. The Suncast 10x10 comes with 2 windows with shutters, 2 window boxes, along with skylights, upper and lower locking door latches and of course the included flooring. The windows with flower boxes are a beautiful add-on to this model, which really differentiates its exterior from the others reviewed. The planters seem to be very sturdy when attached to the window and when filled with planted flowers, they really add some contrast to the entire structure. All in all, we enjoyed this shed and some of the features that make it stand out from its competitors. Based on price point and the lack of clarification on the foundation, we rated this as a 3-Star choice award. If you want a unit that stands out with unique features and will survive harsh winters, this model is a great one to consider. If you’re looking for a stronger shed with a larger complete package of accessories that are included with your shed, we recommend you consider the Lifetime Shed Line.